A Russo-Iranian Bloc against the United States? Russian President Vladimir Putin called his Iranian counterpart Hassan Rouhani on Thursday, according to PressTV. Since Iran is under financial blockade by the United States, increases in bilateral trade with Russia would be very welcome. The Obama administration has threatened to do to Russia what it has done to Iran, so it is in Russia’s interest to explore sanctions-busting opportunities, and trade with Iran (though it won’t be all that significant) is one such. Another area of cooperation between the two is that Russia built three nuclear reactors for Iran at Bushehr, and is rumored to be considering constructing two more. Putin also referred to Iran’s observer status in the Shanghai Cooperation Council (which links Russia, China, Turkmenistan, Uzbekistan, Tajikistan, Kyrgyzstan and Kazakhstan) and spoke of the need to implement the decisions taken recently at Bishkek by the SCC. Iran wants to become a full member of this trading and political bloc, in a bid to escape the isolation imposed on it by the United States. Putin seemed to promise Iran help with reaching a successful agreement with the UN Security Council members plus Germany regarding its civilian nuclear enrichment program, which Iran maintains is peaceful. He said, “We do our best so that Iran’s nuclear issue reaches the final result.” If the P5 +1 can agree on inspections and other procedures to satisfy them that Iran is keeping it peaceful, an international agreement could be reached that would lead to substantial softening of sanctions. 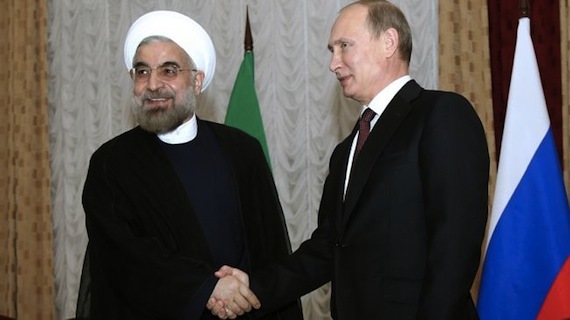 Putin’s call to Rouhani contained little that was new. But it does seem to have involved the trading of some horses and assurances to Tehran by Moscow of mutual help in the face of US hostility to both. The likelihood is that Putin is trying to round up support for his military intervention in Ukraine’s Crimea and his plans to annex that peninsula to Russia. There are lots of ‘you scratch my back, I’ll scratch yours’ kinds of deals that Putin could strike with Iran.